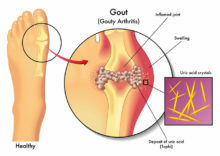 When you picture someone with gout, you may think of an older, overweight man who likes his steak and beer. And that wouldn’t be an inaccurate image. Being male and eating a diet rich in red meat, seafood, and alcohol are some common risk factors for gout.